Home » Assam Govt. 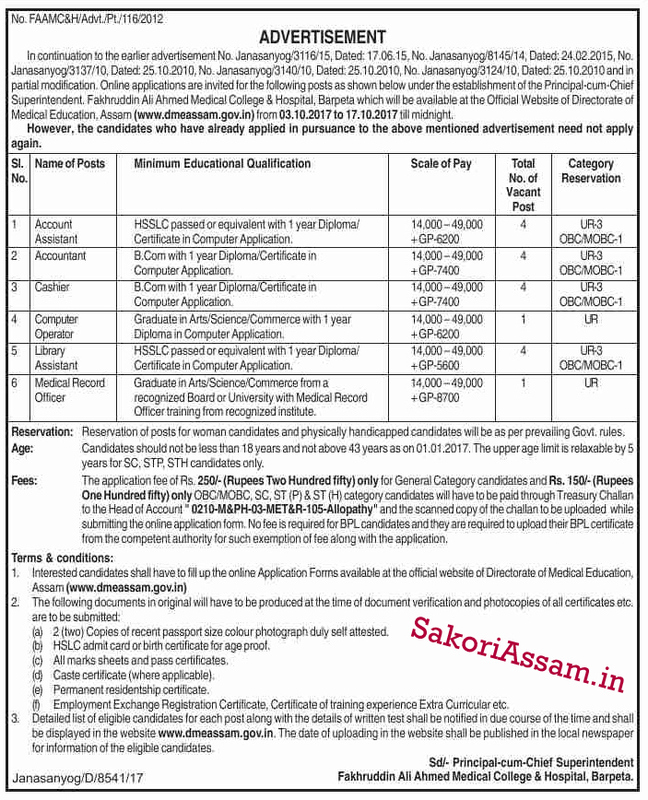 Jobs » FAAMCH Job Recruitment Barpeta, Account Asstt, Accountant, Computer Operator, Cashier etc. 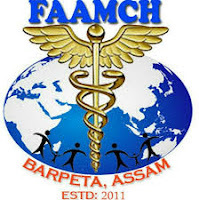 FAAMCH Job Recruitment Barpeta, Account Asstt, Accountant, Computer Operator, Cashier etc. from 03.10.2017 to 17.10.2017 till midnight. However, the candidates who have already applied in pursuance to the above mentioned advertisement (in the official advertisement) need not apply again. No of Posts: 04 [UR-3, OBC/MOBC-1]. 2. Name of Post: Accountant. Educational Qualification: Graduate in Arts/ Science/ Commerce with 1 year Diploma in Computer Application. Age: 18 to 48 years as on 01.01.2017. The upper age limit is relaxable by 5 years for SC, STP, STH candidates only. Fees: The application fee of Rs.250/- (Rupees Two Hundred fifty) only for General Category candidates and Rs.150/- (Rupees One Hundred fifty) only OBC/MOBC, SC, ST(P) & ST(H) category candidates will have to be paid through Treasury Challan to the Head of Account “ 0210-M&PH-03-MET&R-105-Allopathy” and the scanned copy of the challan to be uploaded while submitting the online application form. No fee is required for BPL candidates and they are required to upload their BPL certificate from the competent authority for such exemption for fee along with the application. Last Date: From 03.10.2017 to 17.10.2017 till midnight. 2 (two) Copies of recent passport size photograph duly self attested. HSLC admit card or birth certificate fro age proof. All marks sheets and pass certificates. Employment Exchange Registration Certificate, Certificate of training experience Extra Curricular etc.